Another Figma that isn’t actually mine, also from the Black Rock Shooter series to boot! Another friend of mine had bought this online whilst it was on sale; I merely borrowed it for a quick photoshoot and subsequently this review. I can’t remember if this design is from the OVA or the anime, but I’m fairly certain they barely differ…Mato is actually a really average Japanese school-girl, no striking features to speak of. The figure sculpt itself is pretty well-done; standard Figma fare really. Joints are all exposed, and while I personally consider them an eyesore, I don’t blame Figma for it since it’s kind of what they go for. And of course, with all those exposed joints, articulation is pretty free-moving. I’m almost positive that most of the figure is made from PVC plastics, allowing for even more flex with certain pieces. The most obvious soft piece on the figure would be the skirt – it’s made of two PVC pieces that wrap around to form the entire thing – while it offers mediocre movement of the legs, it’s nothing mind-shatteringly flexible. I still couldn’t get her to sit flat on the ground because the skirt wouldn’t flex back all the way (it technically could, the plastic just springs back into its default shape) and ended up getting an unintentional pantsu shot. And of course, this wouldn’t be a Figma without a plethora of accessories. Two interchangeable facial expressions, a mess of hands, a handbag, a change of shoes, and a basketball. All told this is pretty standard Figma fare. The shoes are certainly interesting – besides being well-molded and sporting some pretty excellent paint apps (them laces!) I’m sure the BRS Star and Converse style are merely coincidences. As I pointed out above, you get an extra set of indoor shoes for the heck of it. Some of the optional accessories in action, including the indoor shoes, cheery face, cell phone, and school bag. The school bag is one piece; nothing really separates, and the strap is made of a soft PVC to allow Mato to wear it rather easily. Generally it fits pretty well over her body, though it does have some leeway so you can move it around and adjust it as you see fit. The strap does of course, move in relation to the bag itself. I should point out for the bag that like all the other accessories, it is extremely well detailed. All the buttons, straps, stripes, and even the little keychain on the zipper are brought to life by extraordinarily well done paint apps. She comes with the standard Figma action base, pretty self-explanatory in the pictures. Of course, with the plethora of hands shown earlier, expect the ability to do quite an extensive range of poses with them. While the fingers are needle-thin, I’m glad Max Factory cast their usual anti-break wizardry upon them, since I didn’t have any snap on me despite screwing around with them quite a bit. The cell phone is a nice touch; it’s molded directly to one of the hands, making swapping it a breeze. Again, very nicely detailed like the rest. This face…seriously, why was it included. I’m not even sure what correlation is has with the series (a yuri bonus for those who own both a Mato and a Yomi Figma perhaps?) but it makes for some pretty amazing posing possibilities. I should also point out that for whatever reason, Max Factory decided to throw us another one of those random hands with holes in the palms meant to hold something. To recap, Samus sported the same feature. And of course, Mato’s key accessory, her precious basketball. Very nice of Max Factory to include this; it’s actually a very enjoyable piece of the figure. There’s a small hole in the basketball itself, which a dedicated hand with a peg in the palm pegs into. Thankfully the connection is pretty tight, so one doesn’t have to worry about the ball falling out of the hand’s grip. The downside is that the weight of the ball weakens the wrist joint of the hand considerably, so having Mato hold it upright may be difficult with gravity working against you. 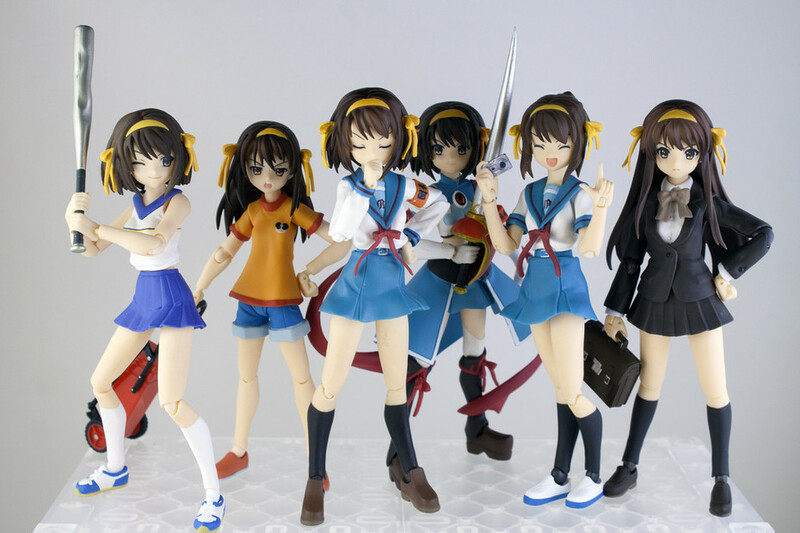 As my first standard “school-girl” Figma (because lord knows they’re legion) I have to say the formula is all right. I’m not particularly drawn to this sort of figure, but I can’t say I didn’t have fun with it. Overall I think Mato would make a pretty good display standing next to a Black Rock Shooter or a Yomi, maybe even for a school diorama. The accessories do certainly add wholesomely to the figure’s play value, and while the joints are a fair eye sore (at least to me) there’s no doubt they do their job.